SKU: Brown 'FEED ME CHOCOLATE' Lanyard. Categories: Yellow VOLUNTEER DRIVER, Yellow VOLUNTEER DRIVER. This lanyard is a professional and convenient way of wearing your identity badge. 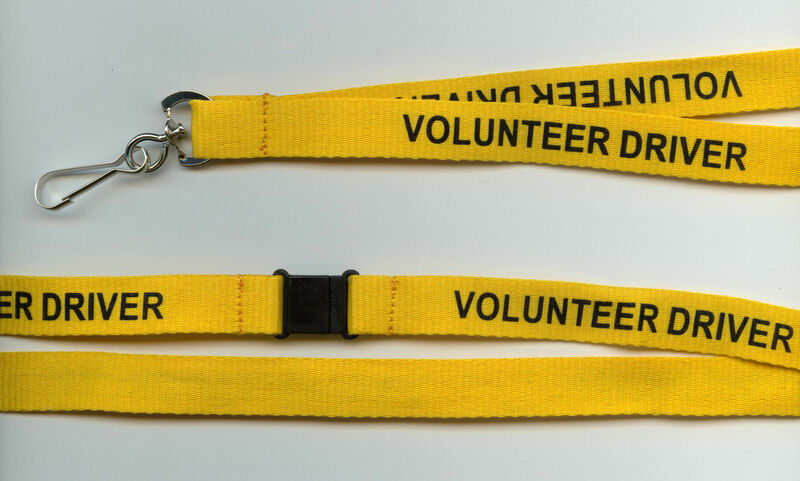 It is a strong yellow material strap, which is soft to wear against your neck & is pre-printed with the word ‘VOLUNTEER DRIVER’. The metal dog clip attaches the strap securely to the card holder. Our range includes ‘NHS’ & ‘NHS STAFF’, ‘CARE ASSISTANT’, ‘TEAM LEADER’, ‘SUPERVISOR’, ‘VOLUNTEER’, ‘FIRST AIDER’, ‘FIRE OFFICER’, ‘SECURITY’ and ‘STUDENT’. Don’t forget to shop for card holders & accessories! We stock single sided, double sided, flexible and rigid card holders in our eBay shop. We have a fantastic selection available in a variety of colours! We also have a full range of pins, clips, strap clips, chains, yoyo reels and magnets! Why not check out our positivID ebay shop? As well as this fantastic customised lanyard offer, we also have a wide variety of card accessories, printers & identity badging software! Please see our ‘about me’ page for further company details.